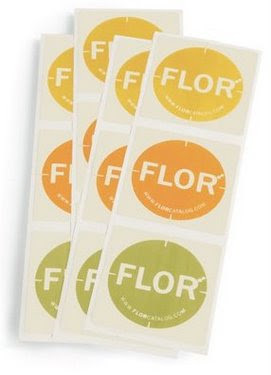 For those of you who don't know about FLOR, they make a nifty product. All of their modular carpet squares measure 19.7" x 19.7". The tiles come in a variety of colors, textures, and patterns - you can arrange them in an infinite number of combinations. I thought that FLOR tiles were only useful for permanent applications, but after Katie's comment, I decided to do some further research. Yes, since they are modular they are easy to pick up pack and move to the next location, great for trade shows. FLOR is engineered with structural integrity to "hug" the floor. Plus, the easy-to-use, non-toxic FLORdots that come with every order are designed to stick to the underside of each tile and not to the floor beneath. Using FLORdots secures the tiles to one another so there's no curling, gapping or slippage. Your design will stay put until you decide to change or replace it. No the FLORdots will need to be replaced when you remove them from each FLOR square. So, FLOR can be used for trade shows if you purchase additional FLORdots. The cost is $4.99 for a set of 12. The cost per tile on the FLOR website starts at $6.49 (when on sale) and can go up to $69.99 each. I was happy to discover that FLOR has an online outlet shop. Prices are much lower there, starting at $3.49 each. For a 10' x 10' booth, you'd need 36 tiles - this would give you a rug that measures 1.8" shy of the full 10' length (118.2"). If you purchased tiles that cost $7.99 each, you'd pay about $288.00 for the entire rug. That's around what I paid for my area rug from Pottery Barn. The advantage over the area rug is that you can customize it further to coordinate with the rest of your booth. I imagine that there's some way to do a FLOR hack, meaning that you can use the tiles but with something other than the disposable FLORdots. Perhaps using industrial strength Velcro? If you're using FLOR tiles for your booth, I'd love to hear about it! Share your experiences with the B.E.S.T. team by sending me an Email and I'll include them in a follow-up post. Be sure to include your name and a link to your Etsy shop. Many thanks to FLOR for granting permission for the use of their product photos in this post. LOVE this idea! Thanks for posting about it... my first time hearing about it.